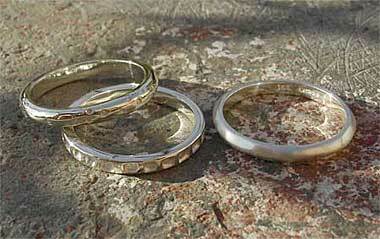 WOMEN'S SILVER RINGS : BRITISH Made : LOVE2HAVE in the UK! The BEST! UK made women's silver rings in unique and contemporary styled sterling silver. Our top quality women's silver rings come in many styles, and most can be personalised to your taste with for example an engraving or the addition of a small diamond or two. Many different finishes are available such as mirror finish, satin finish, hammered or the gorgeous thick textured finish. Our silver rings for women can also be made in many different widths, although women tend to like the thinner styles which are all featured in this section. Whatever your taste, there will be a silver ring listed here to suit any woman.